It happened for the second time. Let's think back. The initial impulse for the first multicellular biota on this earth was triggered over 2 billion years ago by the "Huronian glaciation" and the Great Oxydation Event (GOE). As far as the second impulse is considered, there were probably four ice ages involved in the period between 780 and 580 million years ago. At times, these ice ages covered the entire terrestrial globe, producing the "snowball", as it is referred to, or more appropriately, the "Iceball Earth". 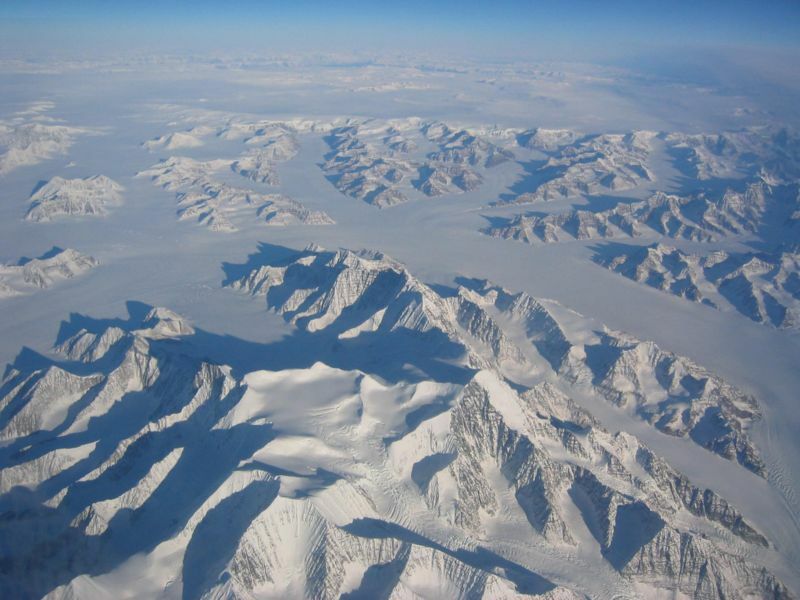 Once again, the end of these glaciation events is connected with a strong increase in oxygen levels in the atmosphere, reaching values up to 15 per cent; this equals about three quarters of today's values. This second GOE is called "Neoproterozoic Oxygenation Event" (NOE). 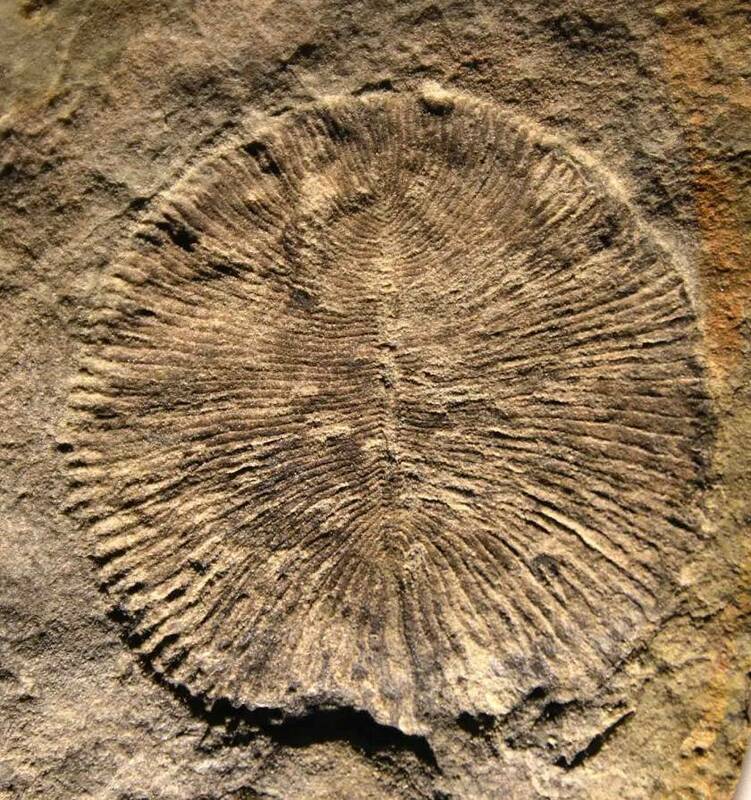 The effect on the animate world was the same as 1.5 billion years before: Macrofossils of the Ediacara biota first appeared 580 million years ago! Obviously, this seems to be another "creative catastrophe". It initiated an incredible, paradise-like submarine world, in which there were neither hunters, nor hunted, neither feeding, nor being fed. Of course, all of this has been hotly debated. If we were sure, no exciting book would be written about it. What were the words Professor Reitner at the University of Göttingen had used? "We cannot prove it anyway, we are only assuming..." Thee may be no proof, but there are certainly numerous pieces of circumstantial evidence in the rocks to help draw conclusions. To give an example: It is assumed that there were four ice ages in the Upper Proterozoic (among others Gradstein 2012): Kaigas glaciation (780-735 Ma. ), Sturtian glaciation (720-660), Marinoan glaciation (650-635) and Varanger or Gaskiers glaciation (582-580). The Sturtian and the Marinoan glaciation are suspected to have been possibly global ("Iceball Earth"). The allegedly so desolate and boring billion has not only produced multicellular life, but was very eventful, also from a geological point of view. The formation of "Rodinia" is one example of these geological events. It was formed by orogenic, mountain-forming, tectonic processes between 1300 and 900 million years ago. This supercontinent broke up about 740 million years ago - presumably because of a "superplume" below Rodinia. In a superplume, hot rock material rises in form of a thin tube from deep layers of the Earth's mantle and spreads in a form of a mushroom underneath the rigid Earth's crust. It has a diameter of thousands of kilometres! The resulting elongated rift valleys and violent volcanism were likely to have caused the disintegration of the supercontinent and a global warming that was probably responsible for the end of the Kaigas glaciation. The pieces then collided about 650 million years ago, forming „Pannotia“, the second Neoproterozoic supercontinent, which existed only until about 540 million years ago: throughout the Ediacara period until the "Cambrian Explosion" - just to disintegrate into the four continents of Laurentia, Baltica, Siberia and Gondwana precisely in this "event" of life. The reason being: The collisions producing Pannotia were of a rather "grinding" nature and the individual continents still showed active "rifting", shoving past each other. The Ediacara biota, too, was thus an evolutionary period between catastrophic - in any case transformational - events of climatic and tectonic kinds. 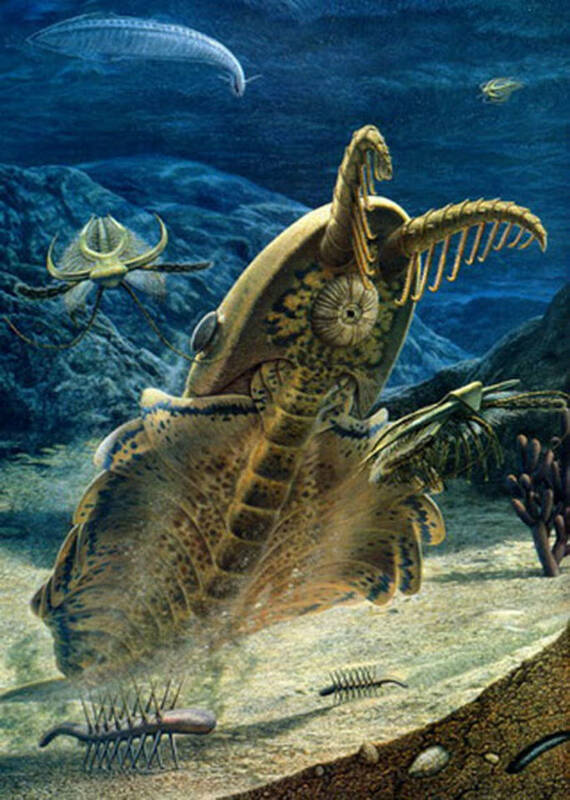 Additionally, the "biota of peace" was confronted with the "Cambrian Explosion" (also "Cambrian Radiation") with creatures well equipped with carapaces and attacking apparatuses, which killed this biota off in no time - only few remained to live in the Cambrian. What were the Ediacara living beings, anyway? On 11 October 2005, the "Frankfurter Rundschau" put it in very illustrative and memorable words: "One of the marine symbiotic communities of the Ediacara was resident in deep waters. The beings living there resembled ostrich feathers, fern fronds, leaves or Christmas trees. They were moving gently with the currents. Other creatures with the shape of a spindle lay flat on the soft sand that would once become the rugged cliffs of Avalon, a peninsula of Newfoundland." In fact, as early as 1868, the first Ediacara fossil - as would turn out later - was found on Newfoundland by the Scottish geologist Alexander Murray. In 1872, the Canadian palaeontologist Elkanah Billings described it as Aspidella terranovica (synonymous of or similar to Cyclomedusa). However, it was certainly not a medusa, but rather the appressorium of a sessile living being. The term Ediacara, by contrast, comes from the finds of Reginald Claude Spriggs, a geologist who explored the Ediacara hills north of Adelaide/Australia in 1946. On the relatively coarse quartzite and sandstone slabs, he found numerous different imprints of soft organisms - the biota of the Precambrian was discovered for the first time. Later on, finds in almost all parts of the world followed - for example in Namibia, Russia, in the Ukraine, China, Canada and in the USA. Apparently, the biota prevailed all over the world. It was not until 2004, however, that the final part of the Proterozoic, in which this third Precambrian biota developed, was named "Ediacara". This was officially done by the International Commission on Stratigraphy (ICS) and confirmed by the International Union of Geological Sciences (IUGS). At that time, most beings were fixed to the ground. They included sponges (Porifera), hydrozoans, scyphozoa, anthozoans, protomedusae, hardly classifiable „vendians“, and many other living beings. However, apparently mobile organisms were found, too. Trace fossils indicate lively digging activities in the seabed. Even fossils with hard parts emerged, which had not been expected among the soft animal biota of the Ediacaran. Two scientists - three opinions. Although the Ediacara biota has become a constant on the geological and palaeontological scale, although it can be proved with ample finds, although it is not questioned, there are still enough starting points for scholarly dispute. The dating is clear, in principle, but the exact boundaries are not. 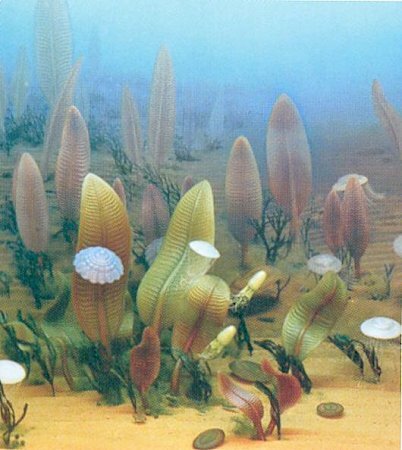 While the end of this period is de-fined with the beginning of the Cambrian, there are disputes about the beginning of the Ediacaran. Sometimes it is scheduled at 635 million years before our time, sometimes at 600 million and sometimes at 580 million years. To me, the last dating seems most probable, as it coincides with the end of the Varanger glaciation. In Newfoundland/Canada, the first macroscopic fossils that are to be interpreted as the first appearance of the Ediacara biota, can be found directly on top of the regionally occurring Varanger glaciation. It is true that the beginning of the Ediacaran era was laid down at 635 million years before our time, but the biota does not seem to have developed until 580 million years ago. The nature of the Ediacara animals is definitely another topic for debate. "As with any new discovery, scientists have differing opinions about the nature of the animals, and even if they were true animals." This is how the website of the Queen's University (Ontario/Canada) described the "Ediacarian fossils". And indeed: In 1983, Professor Adolf Seilacher from Tübingen compared the organisms to "water-filled, quilted air mattresses". Mark A. McMenamin, a US geologist, wrote in 2000 that these organisms were neither plant nor animal. Our ancestors were probably responsible for their eradication... Also Professor Joachim Reitner, the palaeontologist from Göttingen, indicated to the "Frankfurter Rundschau" (No. 236/2005) that "80 to 90 per cent of the Ediacara biota had the typical pneu structure". Reitner: "These beings were certainly not animals." Dr Richard Jenkins, an Australian palaeontologist at the University of Adelaide, is of a totally different opinion. The university harbours one of the largest collections of Precambrian soft fossils. He found out that the fossils had heads, intestinal tracts, delicate skin flaps for breathing, tentacles, gonads, etc. Why didn't the other palaeontologists see this? 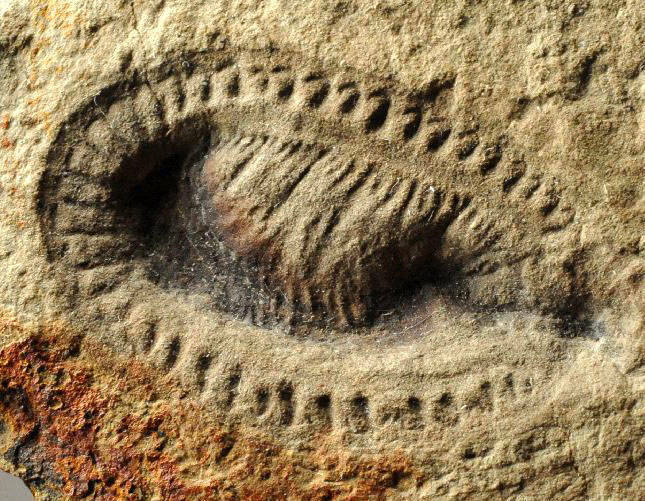 The Ediacara organisms were embedded in a coarser sediment than the Cambrian fossils, thus making more detailed features very difficult to detect and easy to overlook. Jenkins complained already in 1992: Some colleagues simply seem to ignore today's basic knowledge about zoology and genetics. These were unmistakably early forms of corals, ringed worms (annelids) and jellyfish. According to Jenkins, there was a con-tinuous line from the Ediacara biota to modern organisms. In 2003, Prof Matthew E. Clapham, Dr Guy M. Narbonne and Prof James G. Gehling at the Queen's University in Ontario/Canada came to the same conclusion. Studying the Canadian Ediacara biota, they ascertained that the deep sea at that time was quickly colonized by complex organisms. "Species richness, abundance, and diversity values, as well as levels of intraspecific interaction, all fall within the typical range observed in modern slope communities." Gregory J. Retallack (2012), professor at the University of Oregon/USA and director of the local Museum of Natural and Cultural History, had the unusual idea that they might be some kind of lichen plants. Be that as it may, the "compromise" was insinuated by Adolf Seilacher: Apart from the "quilted air mattresses", other forms of complex multicellular life did exist, after all, and Joachim Reitner's "pneus" do leave 10 to 20 per cent of the biota for further theories... A unique biota - for sure, but here again, there were bridges to what had existed before and to what came afterwards. One role in the farewell of Ediacaran could have been played by the disintegration of the supercontinent Pannotia towards the end of the Proterozoic Period. This break-up dramatically changed the appearance of the Earth - the distribution of land and water surfaces, marine chemistry, currents, continental shelf areas, habitats, hence the entire ecology. At any rate, the end of the peaceful Ediacara biota coincided with the "Cambrian Explosion", when more or less suddenly living beings with teeth, claws and grip arms as attack apparatuses emerged, as did on the other hand hard-shelled and spiky beings that knew how to defend themselves. The Vendian biota with its soft parts, that probably fed on algae, bacteria and freely available nutrients, eventually had no chance to survive and was easy prey for the first hunters. Their basis of life - the biomat, on which they colonized and grazed - was probably destroyed by the more mobile organisms. 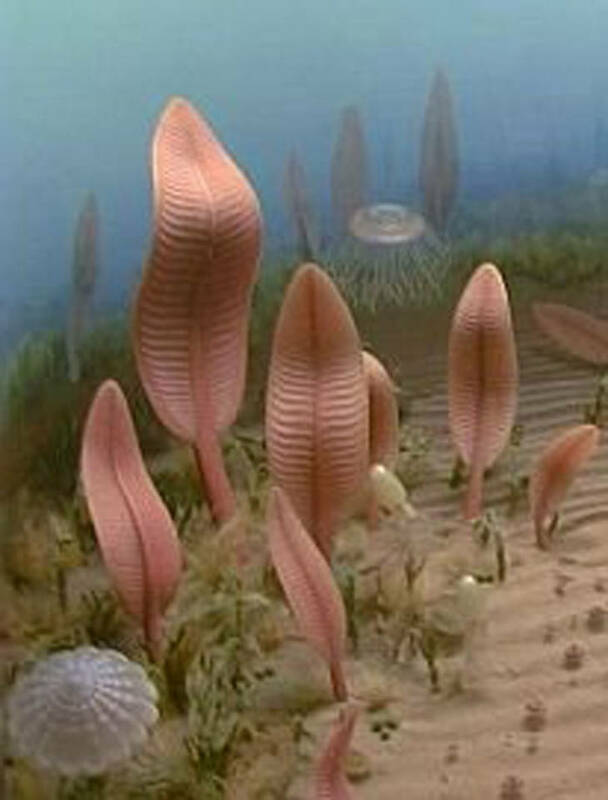 The US Professor David J. Bottjer at the University of Southern California called this "The Cambrian Substrate Revolution" (in "GSA Today", 2000). Living beings gently swaying with the currents - sadly, this had now ended for good. Es geschieht zum zweiten Mal: Wie einst bei der "Huronischen Eiszeit" und der großen Sauerstoff-Katastrophe ("Great Oxygenation Event" GOE), die vor mehr als 2 Milliarden Jahren sozusagen die Initialzündung für eine erste mehrzellige Fauna auf dieser Welt sind, ereignen sich im Zeitraum zwischen etwa 780 und 580 Millionen Jahren vermutlich vier Eiszeiten, die teilweise die ganze Erdkugel bedecken - der "Schneeball" oder besser "Eisball Erde". Verbunden ist das Ende der Vereisungen mit einem erneuten starken Anstieg des Sauerstoffgehalts der Atmosphäre auf bis zu 15 Prozent; das sind immerhin etwa drei Viertel des heutigen Wertes. Man nennt dieses zweite GOE das "Neoproterozoic Oxygenation Event" (NOE). Der Effekt auf die Lebewelt ist derselbe wie 1,5 Milliarden Jahre zuvor: Makrofossilien der Ediacara-Fauna tauchen erstmals vor 580 Millionen Jahren auf! Es ist offenbar wieder eine "schöpferische Katastrophe". Sie initiiert eine paradiesische Unterwasserwelt, in der es weder Jäger noch Gejagte gibt, kein Fressen und Gefressen werden. Alles ist natürlich heiß umstritten. Wenn man ganz sicher wäre, könnte man kein spannendes Buch darüber verfassen. Wie hatte mir Professor Reitner von der Universität Göttingen geschrieben? "Beweisen können wir eh nichts, nur vermuten..." Vielleicht keine Beweise, aber natürlich lassen sich in den Gesteinen eine Menge Indizien für Vermutungen finden. So nimmt man an, dass es vier Eiszeiten im oberen Proterozoikum gegeben hat (u.a. Gradstein 2012): Kaigas-Eiszeit (780-735 Mio. ), Sturtische Eiszeit (720-660), Marinoische Eiszeit (650-635) und Varanger- bzw. Gaskiers-Eiszeit (582-580). Möglicherweise global ("Eisball Erde", siehe Band 1) sollen die Sturtische und die Marinoische Eiszeit gewesen sein. Die angeblich so öde, langweilige Milliarde hat nicht nur vielzelliges Leben hervorgebracht, sondern war auch geologisch gesehen durchaus bewegt. So entstand durch orogenetische, gebirgsbildende tektonische Prozesse im Zeitraum zwischen 1300 und 900 Millionen Jahren "Rodinia". Dieser Superkontinent zerfiel vor rund 740 Millionen Jahren - vermutlich durch einen "Superplume" unter Rodinia, also durch aufsteigendes heißes Gesteinsmaterial aus dem tieferen Erdmantel in einem schmalen Schlauch, der sich dann unter der starren Erdkruste pilzartig verbreiterte - mit einem Durchmesser von tausenden von Kilometern! Langgestreckte Grabenbrüche und heftiger Vulkanismus dürften zum Zerfall des Großkontinents geführt haben und zu einer Erderwärmung, die wohl für das Ende der Kaigas-Eiszeit verantwortlich ist. Die Teile kollidierten dann vor ca. 650 Millionen Jahren und bildeten den zweiten neoproterozoischen Großkontinent "Pannotia", der nur etwa bis vor 540 Millionen Jahren Bestand hatte: die Ediacara-Zeit hindurch bis zur "Kambrischen Explosion" - um genau zu diesem "Event" des Lebens in die vier Kontinente Laurentia, Baltica, Sibiria und Gondwana zu zerfallen. Der Grund: Die Kollisionen, die Pannotia entstehen ließen, waren eher "schleifender" Natur, und die Einzelkontinente zeigten nach wie vor aktives "Rifting", schoben sich aneinander vorbei. Auch die Ediacara-Fauna ist demnach ein evolutionäres Intervall zwischen katastrophalen, jedenfalls umwälzenden Ereignissen klimatischer und tektonischer Art. Hinzu kommt die für die "Friedens-Fauna" tödliche "Kambrische Explosion" (auch "Radiation") mit gepanzerten und mit Angriffswerkzeugen ausgestatteten Lebewesen, die dieser Fauna kurzfristig den Garaus machen - nur wenige überleben ins Kambrium hinein. Wer oder was waren denn nun die Ediacara-Lebewesen? Sehr bildhaft und einprägsam hat es die "Frankfurter Rundschau" vom 11. Oktober 2005 beschrieben: "Eine der Lebensgemeinschaften im Ozean des Ediacariums war im tiefen Wasser angesiedelt. Dort wiegten sich Wesen, die Straußenfedern, Farnwedeln, Blättern oder Weihnachtsbäumen ähnelten, sanft in der Strömung. Andere, spindelförmige Kreaturen lagen flach auf dem weichen Sand, der später zu den zerklüfteten Klippen der zu Neufundland gehörenden Halbinsel Avalon werden sollten." Tatsächlich ist das erste Ediacara-Fossil - wie sich später herausstellte - bereits 1868 auf Neufundland von dem schottischen Geologen Alexander Murray gefunden und 1872 von dem kanadischen Paläontologen Elkanah Billings als Aspidella terranovica (synonym oder ähnlich Cyclomedusa) beschrieben worden; sicherlich keine Meduse, eher die Haftscheibe eines sessilen Lebewesens. Die Bezeichnung Ediacara-Fauna kommt dagegen von den Funden des Geologen Reginald Claude Spriggs, der 1946 die Ediacara-Hügel nördlich von Adelaide/Australien erkundete. Auf den relativ groben Quarzit- und Sandsteinplatten fand er zahlreiche unterschiedliche Abdrucke von weichen Organismen - zum ersten Mal wurde eine Fauna des Präkambriums entdeckt. Später folgten Funde in fast allen Teilen der Welt - zum Beispiel in Namibia, Russland, Ukraine, China, Kanada und USA. Die Fauna war offenbar weltweit vorhanden. Erst im Jahre 2004 wurde der letzte Zeitabschnitt des Proterozoikums, in dem sich diese dritte präkambrische Fauna entwickelte, "Ediacarium" genannt. Und zwar ganz offiziell durch die International Commission on Stratigraphy (ICS), bestätigt von der International Union of Geological Sciences (IUGS). Damals existierten Schwämme (Porifera), Hydrozoen (Hydrozoa), Schirmquallen (Scyphozoa), Blumentiere (Anthozoa), Proto-medusen, kaum zuzuordnende "Vendobionten" und viele andere Lebe-wesen, meist fest verankert. Aber auch offenbar bewegliche Organismen wurden gefunden. Spurenfossilien weisen auf rege Wühltätigkeit im Meeresboden hin. Sogar Fossilien mit Hartteilen kamen zum Vorschein, was man von der Weichtierfaune des Ediacariums gar nicht angenommen hatte. Zwei Wissenschaftler - drei Meinungen. Obwohl die Ediacara-Fauna eine feste Größe in der geologischen und paläontologischen Skala ist, mit reichlich Funden belegt werden kann und nicht bezweifelt wird, gibt es aber noch genügend Ansatzpunkte für Gelehrtenstreit. Die Datierung ist im Kern klar, jedoch nicht genau begrenzt. Während das Ende dieser Periode mit dem Beginn des Kambriums definiert wird, gibt es Probleme mit dem Beginn des Ediacariums, der mal mit 635 Millionen Jahren vor unserer Zeit angesetzt wird, mal mit 600 Millionen Jahren und mal mit 580 Millionen Jahren. Mir erscheint die letzte Datierung am wahrscheinlichsten, da sie mit dem Ende der Varanger-Eiszeit übereinstimmt. In Neu-fundland/Kanada liegen in den Sedimenten unmittelbar über denen der regional auftretenden Eiszeit die ersten makroskopischen Fossilien, die als das erstmalige Auftreten der Ediacara-Fauna zu interpretieren sind. Zwar wurde der Beginn des ediacarischen Zeitalters mit 635 Millionen Jahren vor unserer Zeit festgelegt, die Fauna entwickelte sich aber offenbar erst ab 580 Millionen Jahren. Mark A. McMenamin, ein US-amerikanischer Geologe, schreibt 2000: "Diese Organismen waren weder Pflanzen noch Tiere. Unsere Vorfahren waren es aber wahrscheinlich, die sie schließlich ausgelöscht haben." Auch der Göttinger Paläontologe Professor Joachim Reitner gab der "Frankfurter Rundschau" (Nr. 236/2005) zu verstehen, dass "80 bis 90 Prozent der Ediacara-Fauna die typische Pneu-Bauform" haben. Reitner: "Diese Wesen waren sicher keine Tiere." Ganz anders der australische Paläontologe Dr. Richard Jenkins von der Universität Adelaide, die über eine der größten Sammlungen präkambrischer Weichtiere verfügt. Er entdeckte an den Fossilien Köpfe, Darmtrakte, feine Hautlappen für die Atmung, Tentakel, Keimdrüsen usw. Wieso haben das die anderen Paläontologen denn nicht gesehen? Die Ediacara-Organismen waren in einem gröberen Sediment eingebettet als die kambrischen Fossilien, so dass detaillierte Merkmale nur schwer erkennbar und deshalb leicht zu übersehen sind. Jenkins beklagt bereits 1992: "Einige Kollegen scheinen schlicht zu ignorieren, was heute an zoologischem und genetischem Grundwissen vorliegt." Er sieht eindeutig Frühformen von Korallen, Ringelwürmern (Anneliden) und Quallen. Es gebe, so Jenkins, "eine kontinuierliche Linie von der Ediacara-Fauna zu modernen Organismen." Zu demselben Schluss kommen 2003 Prof. Matthew E. Clapham, Dr. Guy M. Narbonne und Prof. James G. Gehling von der Queen's University in Ontario/Kanada. Sie stellen anhand der kanadischen Ediacara-Fauna fest, dass die Tiefsee damals schnell von komplexen Organismen besiedelt wurde. "Der Artenreichtum, die Häufigkeit und ausgeprägte Vielfalt ebenso wie der hohe Grad an intraspezifischer Wechselwirkung - alles liegt im typischen Bereich heutiger Faunengemeinschaften." Dass es sich um flechtenähnliche Landpflanzen handeln könnte - dieser ausgefallenen Meinung ist Gregory J. Retallack (2012), Professor an der University of Oregon/USA und Direktor des dortigen Museums für Natur- und Kultur-geschichte. Wie dem auch sei - den "Kompromiss" hat Adolf Seilacher angedeutet: Neben den "abgesteppten Luftmatratzen" gab es eben doch auch komplexe mehrzellige Lebewesen, und Joachim Reitners "Pneus" lassen ja noch 10 bis 20 Prozent der Fauna übrig... Eine einzigartige Fauna - gewiss, aber es gab auch hier Brücken zum Vorher und Nachher. Eine Rolle beim Abgesang für Ediacara kann der Zerfall des Großkontinents Pannotia gegen Ende des Proterozoikums gespielt haben, was das Gesicht der Erde - die Verteilung von Land- und Wasserflächen, die Meereschemie, Strömungen, Schelfgebiete, Lebensräume, also die gesamte Ökologie - drastisch veränderte. Das Ende der friedlichen Ediacara-Fauna kommt jedenfalls mit der "Kambrischen Explosion", als mehr oder weniger plötzlich Lebewesen mit Zähnen, Klauen und Greifarmen als Angriffswaffen auftauchen (wie Anomalocaris) und andererseits hartschalige und bestachelte Lebewesen, die sich zu verteidigen wussten. Die weichteiligen, sich vermutlich von Algen, Bakterien und freien Nährstoffen ernährenden Vendobionten hatten schließlich keine Chance des langfristigen Überlebens und wurden leichte Beute der ersten Jäger. Ihre Lebensgrundlage, die Biomatte, auf der sie siedelten und weideten, wurde wahrscheinlich durch die mobileren Organismen zerstört. Der US-amerikanische Professor David J. Bottjer von der Uni-versity of Southern California nennt das "The Cambrian Substrate Revolution" (in "GSA Today" 2000). "Wesen, die sich sanft in der Strömung wiegen" - damit war jetzt leider Schluss.